ITG Antiox™ synergistically combines many nutrients that have a positive effect on the immune system. This formula contains multiple nutrients known to raise glutathione levels making it helpful for supporting phase II liver detoxification. It also combats free radicals and helps detoxify harmful chemicals including heavy metals. L-Leucine when taken with NAC prevents mercury from being reabsorbed into the cen­tral nervous system. ITG Antiox is also designed to aid the production of metallothionein. 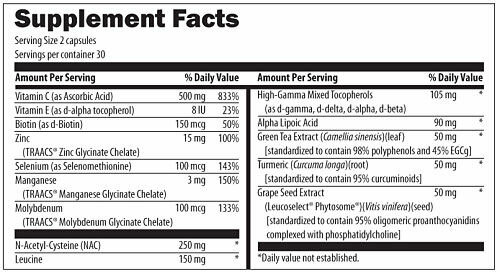 The vitamin E is 60% gamma, mixed tocopherols. Lipoic acid regenerates vitamins E and C and supplies sulfur for detoxification. This powerful formula also provides the well-researched antioxi­dants green tea, grape seed extract and curcumin. Lipoic Acid regenerates the Vitamin E and C in this formula so they can have long acting antioxidant activity. It also provides SH (sulfhydryl groups) that protect against metal toxicity including iron and copper. Vitamin E protects cell membranes from oxidative destruction and retards breakdown of cell membranes. Literature shows that vitamin E can reduce the toxic effects of mercury. Vitamin E reduces chromosomal breakage and has sulfhydryl- protective abilities. Selenium helps to make glutathione enzymes needed for liver detoxification of harmful chemicals. This is the primary nutrient for binding mercury to allow for its excretion. Selenium also enhances the antioxidant abilities of vitamin E.
The zinc and selenium are bound to methionine which aids the synthesis of metallothionine, the important zinc binding protein, known to aid the removal of heavy metals such as cadmium. Methionine is a sulfur containing amino acid involved in Phase II detoxification. Polyphenols from grape seed extract and green tea have been shown to protect against iron and copper toxicity by chelating them.